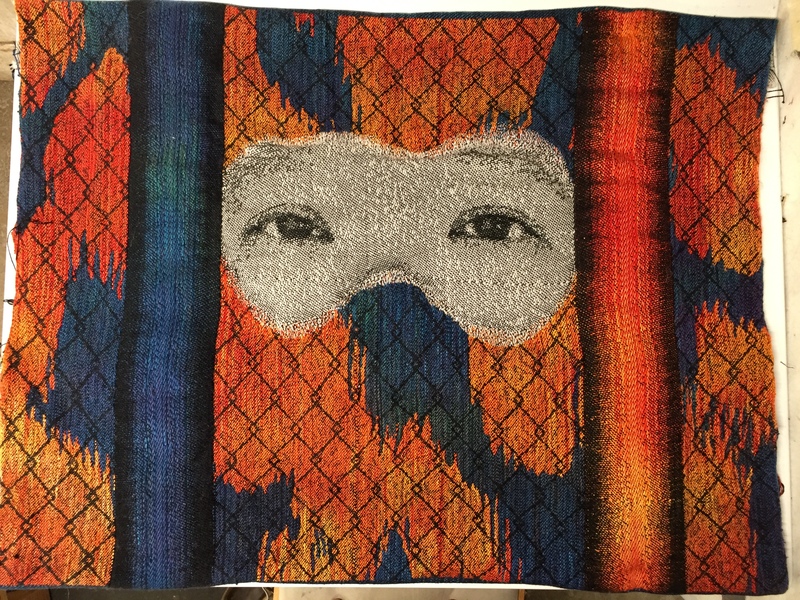 You are here: Home / All blog posts / Finished weaving “Bipolar Prison”! I think it’s the perfect title. Bipolar is like that. It’s a beautiful piece. 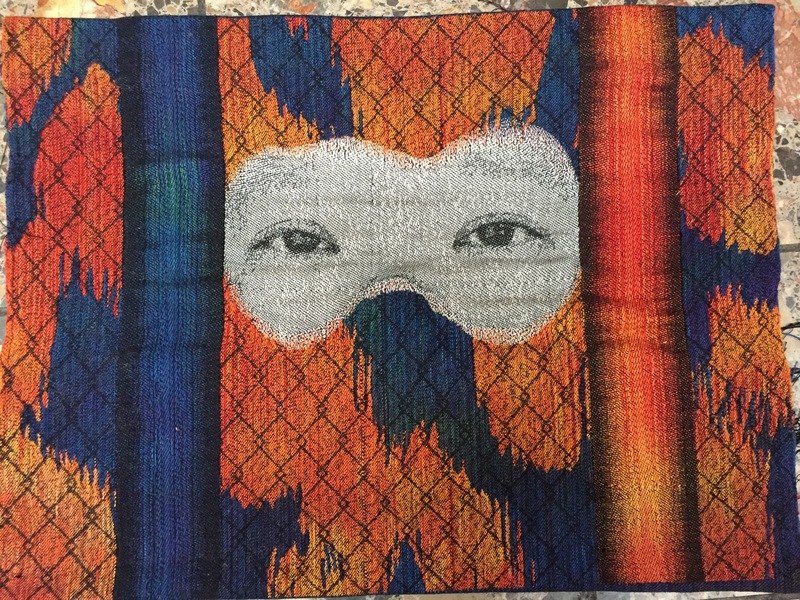 I can’t find the right words for it, but I love the eyes looking OUT at the world from the bipolar prison. Seeing/recognizing the (nearly) limitless world but feeling trapped in a world limited by illness. No dust gathering under your feet! Good job on completing the weaving. Looking forward to seeing in in person some day. Constrained by Extreme Highs and Lows? I don’t know, I’m thinking Bipolar Prison still explains it succinctly and best. Thanks! It’s not a bad title, and I may wind up using it if I can’t think of something better. The use of the word “Bipolar” focuses the viewer on one mental illness. Great if that’s your intention. What on the piece represents the nature of the bipolar condition? The red vs the blue? “Inside the Prison of my Mind” is too wordy, and which part is “inside” the mind? Clearly you want people to think of mental illness as a prison for the mind, and your piece is very dramatic. I can hardly wait to see it after the quilting! What kind of reaction do you hope to evoke from the viewer? You could purposely give the piece a provocative name by using non-PC words and shock the viewer right into your message. Example: Trapped in Crazy Jail. What kind of expression are you going for with the eyes? Sadness? Pleading (for help)? A single tear would be a nice touch. Or Emptiness? Blankness? Lack of power? The ultimate trap because not only can you not escape, you don’t understand that you’re trapped. I guess my point is that the title needs to reinforce the impact you want to have on the viewer. Mental illness is like a prison has no impact, no power. Figure our the emotional impact you want to have and the right title will come to you. – Yes, the focus is meant to be on bipolar disorder; the red/orange represents mania, the blue depression. I have bipolar disorder, so this speaks of my own experience before being diagnosed and finding the right medication regimen. – Sounds weird, I know, but i hadn’t thought of what reaction I wanted to elicit from the reader. I’ll have to chew on that a bit. Thanks for helping me frame the problem – this is really helpful!